The Sherpa villages of Helambu in the north of Kathmandu valley provide an easy getaway to the district of Sindhupalchowk. The district with its low elevation and the Sherpa villages, the district can be reached on a 6 day trek campaign. The short drive from Kathmandu to Sundarijal marks the start of the journey and the trail from here leading to Helambu climbing up to the Shivapuri ridge is the beginning of what will result in an interesting about a week long trek to the beautiful district of Sindhupalchowk. 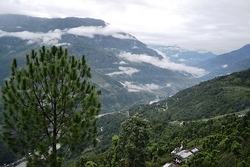 The trek route passes through the Helambu village with an altitude of 1,370 m to 3,490 m. Accompanied by the breathtaking views of the central Himalayas, the trail heads north to Thare Pati following a ridge-line before turning east to Melemchi Gaon and Tarke Gyang, the major villages of this area. The comfortable accommodation services here are provided in the lodges operated by the local families and usually the trek starting with a drive from Kathmandu includes all meals, services of experienced guides and porters to carry luggage enabling the clients (trekkers) to walk at their own pace carrying a light day-pack only. From Melemchi Gaon or Tarke Gyang, a visit to Shermathang can be made before descending to the Melamchi River to end the trek with a drive from the Melamchi bazaar back to Kathmandu. From Kathmandu, another short trek to the Helambu Circuit can also be conducted that would last for two to three days. This trek will get you in contact with the locals and helps you understand their social and cultural aspects. Also, the rivers and mountains in Sindhupalchowk region is another touristic attraction, especially for those who love to go on a trek. Laying closer to Kathmandu, the district of Sindhupalchowk offers some of the best destinations for long and short trek in the region.